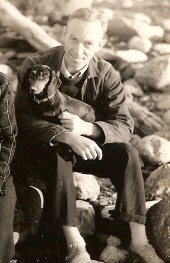 The Dachshund is believed to have originated in Germany over 400 years ago. It appears that the breed was evolved in an attempt to counter the threat of badgers. In fact, the word “Dachshund” — pronounced “dacks-hoont”, by the way — is derived from the German words for badger (“Dachs”) and hound (“hund”). So, the Dachshund is, beneath all the layers of modern breeding, really a hunting dog. And that should you give you the first inkling of what to expect in your Dachshund's temperament. A successful hunter is smart, an independent thinker and courageous. And the Dachshund is no exception. Because he is so intelligent, he will need to be engaged. Regular exercise, a reasonable amount of training and, if possible, a companion (dog) would help. Dachshunds would also fit in well with single people or retired couples who have the time that this breed needs. The Dachshund’s independent streak is a great trait when hunting because it makes them quite resourceful and in little need of instruction. However, in a more typical household setting, your Dachshund’s “independent thinking” may tend to clash with yours. You will need a healthy dollop of persistence and tons of patience during training sessions. Your Dachshund may be a trifle confused when it comes to the question, “Who’s the boss?”. He loves being in charge and this can sometimes even translate into aggression towards you. You will have to train him thoroughly to ensure that this does not become an issue. Once he has accepted you as the boss though, you will find that he is devoted and loyal to you, always ready to “come to your rescue” in the presence of strangers. The Dachshund is often a one-person dog, following you around wherever you go. The hunter in the Dachshund is always ready to rise to the occasion and that instinct will trigger explosive outbursts at the slightest hint of an incursion into his territory. Strange humans, animals, even vehicles can result in hysterical barking. Or, if you live in an apartment, even the doorbell. Which can be quite an embarrassment to you, but it is something that you possibly just have to live with. If you have trained your dog well, a quick word from you will bring immediate auditory relief. Dachshunds can be extremely lively and playful, making a game out of anything, even something as mundane as mopping the floor. However, their independent (hunting!) streak often takes them into trajectories quite different from yours. You are trying to get a job done, he thinks its a game. If you throw a ball for him, he will streak off after it, his short legs flailing furiously, but you may find that he’s reluctant to actually bring it back to you. A 2008 study carried out by the University of Pennsylvania in which around 6,000 owners were questioned suggested that the Dachshund topped a list of 33 breeds when rated for their aggression, higher than the Rottweiler or Pit Bull. Chihuahuas were second!. Up to one in five Dachshunds had bitten or tried to bite a stranger while up to 30% of them had attacked other dogs. Researchers did note, however, that such bites were rarely serious. All the same, this statistic highlights the importance of thorough socialization and training of your dog, started right from the day you acquire him from the breeder. I would rather train a striped zebra to balance an Indian club than induce a dachshund to heed my slightest command. When I address Fred I never have to raise either my voice or my hopes. He even disobeys me when I instruct him in something he wants to do. So, the Dachshund is quite a package! Remember, though, that this article describes the breed in general. Not your pet! For the temperament of individual dogs — just like their masters — can vary a lot. 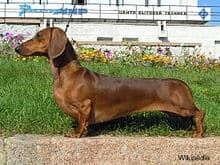 If you are clear about what you want in your Dachshund prior to visiting the breeder, you will have a better chance to pick the puppy that’s right for you. After that, it’s just the little matter of training! Good luck. Previous post: Why Do Dogs Chase Their Tails?